The variant discussed in this blog post is an older variant, so certain infection mechanisms may have changed, as well as C&C's. The point of this post is to familiarize yourself with ELF malware in a better way - how to diagnose, analyse, remove and finally prevent malware from infecting your Linux machines. A lot of malware is going around and it's not (all) exclusively for Windows machines. In computing, the Executable and Linkable Format (ELF, formerly called Extensible Linking Format) is a common standard file format for executables, object code, shared libraries, and core dumps. In other words: ELF is to Linux as PE (.exe, .com, .scr, ...) is to Windows and Mach-O to OS X. More information about the ELF format can also be found at the Resources section. 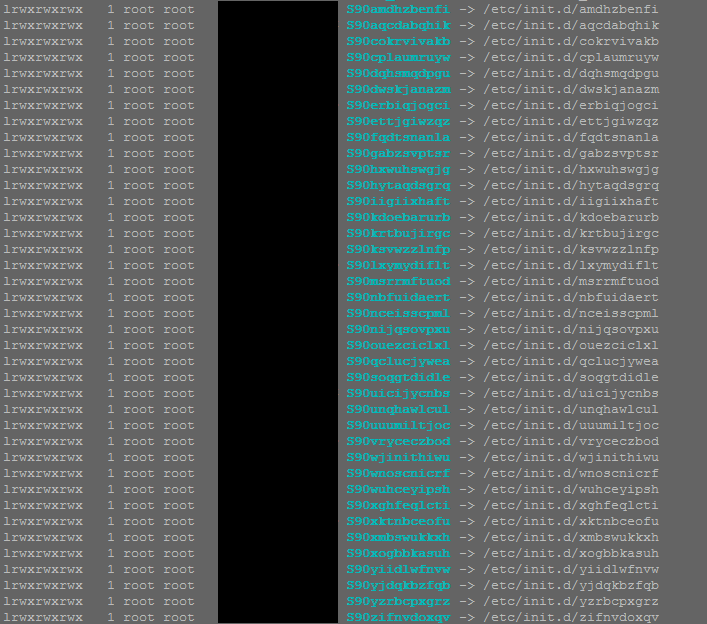 Fuzzy reversing a new China ELF "Linux/XOR.DDoS"
In short: Xor.DDoS is a multi-platform, polymorphic malware for Linux OS and its ultimate goal is to DDoS other machines. The name Xor.DDoS stems from the heavy usage of XOR encryption in both malware and network communication to the C&Cs (command and control servers). There have been other write-ups about this malware as well, which will be mentioned throughout this article or referenced in the Resources section. How do you know you're infected with Xor.DDoS? First and foremost (and obviously), you'll be conducting DDoS attacks from your machine(s) to targets chosen by the malware authors. You may use netstat to print any current network/internet connections. Use tcpdump to get a more detailed analysis of which packets you are sending out. Secondly, another indication is seeing processes running with random names and sudden new executable files created in /etc/init.d/ or /usr/bin/ (see example below). New entries will be/are added to your crontab as well (/etc/crontab). You may use any command based on top or on ps to check for running malicious processes. We will see more in the Disinfection part of this blog post. Thirdly, if you are running the standard OpenSSH server you may see an unauthorised but successful login and immediate logout afterwards. To ensure your machines will not get pwned, be sure to read the Prevention part of this blog post. First off, we have to identify how the malware entered the system. Usually, a weak root password is used (like admin or 123456, see here for a list of tried passwords. Note: huge .txt file!) or the attackers are brute forcing their way in. (brute forcing the SSH credentials of the root user) Another, but less common possibility, is exploiting a vulnerable service that you have running (Apache for example). This variant copies itself over to /lib/libgcc.so, then creates a copy in /etc/init.d and a symbolic link to /usr/bin. Afterwards a new cron script is created and added to the crontab. We will now take a look at one of the samples created - named bmtsfnlgxu. We can see it's an ELF 32-bit executable for i386 - and it's not stripped. This gives us more information already, for example; the magic (7F 45 4C 46 for ELF files, 4D 5A for MZ files) 2's complement, little endian, the exact type of the file (an executable; other types for ELF files may be a relocatable file, a shared object, a core file or processor specific) but most importantly here being the Entry point address, or the start of the program. Note that VirusTotal has added (since November 2014) detailed ELF information in reports as well, which is more or less similar to readelf's output. To disassemble the file, we can use objdump which allows us to disassemble only those sections which are expected to contain instructions (-d parameter) or to disassemble the contents of all sections (-D parameter). However, to dive a bit deeper into the malware code, we will be using IDA, a multi-processor disassembler and debugger and Radare, a well-known (portable) reversing framework. Note that it will still be a quick glance, as MalwareMustDie has already reported extensively about it as well . Note also that it's always a good idea to analyse malware in a virtual environment (VM). We will be using both tools on Windows, but you can just as easily run them on Linux or Mac. Download IDA Pro Free for Windows from here. If you're interested in working more with IDA, there's a handy list of IDA plugins available here. Download radare2 for Windows from here. More documentation about Radare can be found here. There's also a handy cheat sheet available here. Using ELFparser you can also look at the ELF header, sections, but also all of its capabilities like Information Gathering and Network Functions for example. It's a handy second-opinion tool. Finally, one last tool which should not be missed when analysing ELF files: a sandbox. We will be using detux, a multiplatform Linux sandbox. You have Network Analysis (IPs connected and DNS queries) and Static Analysis (Elf Info and Strings). In our example we have connections to wangzongfacai.com, not an unfamiliar domain. View the complete report made by Detux on our file here. Detux report of that file here. When I sent the latter file to VirusTotal several months ago, it only had 12 detections, after re-submitting it had 19 detections. That's better but we're still not there. Just a visual representation of detection difference. Read this for info. You may find an overview of all gathered files as well as most common/recurring domains and their IPs they connect to/download from here, available via AlienVault's OTX. That's it for our Analysis section, let's move on to Disinfection. Identify malicious processes: run ps ef (ps stands for process status) to see which processes are running. Alternatively, you can use top or again ps with other parameters, for example ps ej or ps aux for a more complete, human readable table. Look for processes with random names; in our example it started with S90 and random letters afterwards, linked to files with all random names, as is the case in our example malware named bmtsfnlgxu. Identify malicious files: look for newly created files in /etc/init.d/, /boot/ and /usr/bin/. Again, look for files with random names. You may also use the command ls -lat | head to view recently changed files. As said earlier, delete these files manually, as well as the file(s) mentioned in the scripts. (in this case: /lib/libgcc.so.bak, /lib/libgcc.so and /lib/libgcc4.4.so.) Note that these files are not related to GCC's runtime library and thus can be safely deleted. It's just another way how the malware tries to hide itself. Also double-check there are no malicious files or scripts in /etc/rc.d. If so, remove them as well. Note: in case you see any other malicious processes, go through the last 2 commands again. Use rm -rf to permanently remove a file. Be careful with this command. It's also possible the malware is temporarily storing files into /tmp/ while you are trying to kill its processes. When that happens, use the same chattr command on the /tmp/ directory and start over. If you are in doubt, use that chattr command on all aforementioned directories and start over. Very important: do not forget to use chattr -R -i on them afterwards! When you have either of these available, don't forget to change all passwords afterwards to prevent re-infection - and patch your machine(s)! Some Xor.DDoS variants may also incorporate a rootkit. In that case, hope you have a "best case scenario" available to you. Once a box is fully compromised, it may be hard to reinstate it back to normal or its original state. For double-checking for rootkits and other malware, you may want to check out chkrootkit or alternatively, rkhunter. Additionally, you may download and install an antivirus, for example ClamAV. If you perform manual clean-up as indicated above and have confirmed all is in order again, you can install ClamAV and perform an extra scan to be sure. Better be safe than sorry. Then, follow the prevention tips below to stay safe. Don't open the incoming SSH port (default 22) to ANY, but rather restrict it to trusted IP addresses. Use a strong firewall. In Linux there are many options, iptables is a solid choice. A good basic iptables howto can be found here. In a network or if you need to protect several machines, you may want to consider a seperate hardware appliance as your firewall/UTM/... of choice. Iptables can do a very decent job once properly configured. In case you want to do less manual work, I advise to check out sshguard or artillery. Both can monitor and alert you when something funky happens. In the context of our blog post, it also looks for & protects against SSH bruteforce attempts. Another application to consider is fail2ban. An additional tool is snort. For more information about these tools, refer to their pages. Consider using SELinux. Security-Enhanced Linux is a compulsory access control security mechanism provided in the kernel. Consider disabling remote root login. Read how to do that here. If you browse a lot, consider using NoScript as well. Keep your software and applications up-to-date, as on any system. Consider installing an antivirus as second opinion or at least as an additional layer. This is not a necessity but may come in handy. I recommend ClamAV. Don't forget to protect other appliances that may be running on *nix systems, for example your router (and nowadays, IoT devices). Upgrade the firmware as soon as possible and change the default root/admin password(s). Install updates/patches for your particular firewall/UTM/... as well. Note that this list is not complete and new ELF malware may pop up every day. (it's not a question of if, but when it will pop up) You can find a list of (interesting) Linux malware here. My colleague from Panda France, Julien Gourlaouen for informing me about this incident. Everyone who helped, helps and will help in battling creators of ELF malware, in particular @MalwareMustDie for their excellent research and increasing awareness about these threats. Last but not least, thank you for reading my blog post. MalwareMustDie - Fuzzy reversing a new China ELF "Linux/XOR.DDoS"
MalwareMustDie - A bad Shellshock & Linux/XOR.DDoS CNC "under the hood"